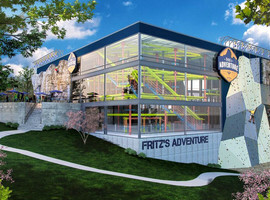 Opening in the summer of 2016, Fritz's Adventure will offer exciting challenges for the whole family in a multi-dimensional indoor environment open 365 days a year. Throughout three stories – and 80,000 square feet – of tunnels, slides, swings and zip-lines, adventurers of all skill levels will be able to tackle rock-climbing walls, a massive ropes course, a life-size water tower and an air-worthy airplane perfect to explore. Plans for the $10 million Branson attraction were unveiled Oct. 6 as part of the city's New Spirit of 76 project designed to revitalize the famous Highway 76 corridor. Fritz' Adventures is currently underonstruction at the site of the old Silver Fountain Inn on west 76, next to the Dixie Stampede. "It will include Ozark rock formations and trees in an urban steel jungle ... It's the conglomeration of natural and manmade structures," project spokesman Ted Cunningham said at the unveiling. "This place is the ultimate thrill-package experience that brings out the child in you." What Cunningham called a "conglomeration of natural and man-made structures" will be an adventure park meant for exploration that carries a perceived element of risk, all within a strategically-engineered and safe environment. Adventurers young and old will be able to experience the world in a ways that wouldn't be possible in any other scenario. As far as the New Spirit of 76, city leaders hope the project will make the Branson strip more accessible for walkers and bicyclists, even someday adding a trolley, to ultimately turn Highway 76 into a linear amusement park, complete with an unbroken chain of attractions, restaurants and retail shops. "The idea is to make the attractions surrounding the highway so inviting that people will be more willing to walk from one attraction to another without realizing how far they are walking," Branson director of planning and development Joel Hornickel told the Joplin Globe. “Fritz's Adventure plays right into that and takes advantage of a property that has been underutilized for years."